Media captionBerlin resident Ibrahim Colak: "I saw one girl shouting for her mummy"
"People were drinking. There was Christmas music, Christmas lights. It was so festive and then there was just this horror in front of you." 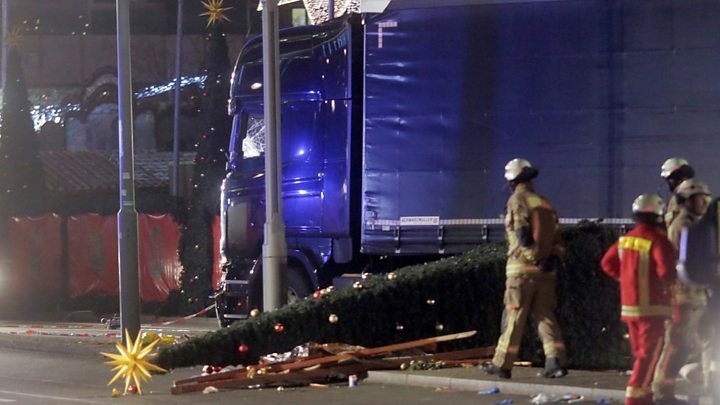 British tourist Emma Rushton sounds dumbfounded as she describes the scene at Breitscheidplatz in the centre of Berlin after an articulated lorry ploughed into a busy Christmas market, killing 12 people and injuring 48. On her first visit to Berlin, Ms Rushton, from Rugby, Warwickshire, said she had an "incredibly, incredibly lucky" escape. "We were waiting, looking around at the lights and waiting to go back to the hotel when we heard an almighty bang. "We looked around and saw lights being torn down by the lorry and the huts in front of us... were completely crushed. "It completely decimated the hut where we had bought wine, and it carried on going. "It was about eight, 10ft in front of us, and had we left two minutes earlier we would have been right in the path of it." Her whole body went numb, she said, and her first thought was to call her mum to let her know she was ok.
"To walk back to our hotel, we had to walk back through the carnage that had been created and saw people holding their heads. There were a couple of people in the recovery position. There was glass and wood everywhere. It was horrendous. "It was Monday evening. There were lots of tourists there, people leaving work. It was busy. There were lots of people enjoying a festive evening." She described how the lorry went straight through the middle of the square, making no attempt to slow down. Ms Rushton, a journalist, added: " I was working in a newsroom the morning after the Nice attack and it was so reminiscent of that. I never thought I would be in the middle of it." Another British visitor to the market, Mike Fox, from Birmingham, told how he helped rescue people trapped under collapsed market stalls. "As we were leaving the large truck came through," he said. "It had just passed me, passed my girlfriend. I think it had missed me by three metres - missed her by five. Mr Fox said he spoke to two people who were lying on the floor with broken limbs "but they were going to be OK". He added: "I saw one guy being dragged away with blood on his face. I helped several other people lift the side of one of the stalls up so that they could pull two other people from underneath." Newspaper editor Jan Hollitzer said the "horrible scenes" in his home city also reminded him of the aftermath of the lorry attack in Nice during the summer, which claimed the lives of 86 people. He began streaming a live video on Facebook in the moments after the attack. "I heard the noise and the screams," he said. Mr Hollitzer, who works for Berliner Morgenpost, described the devastation in the market - the destroyed stalls, broken glass, crockery "and fluids - it could be red wine, could be blood - I don't know". He added: "I saw some people lying on the ground and also some people under the truck. It was really horrible and as chaotic as you can imagine." Nearby, Reverend Katerina Stiefel was practising a Christmas service with teenagers in her church. She told the BBC: "The Christmas market is all around the church, so usually there is a lot going on in the evening - a lot of people talking, celebrating, Christmas music. "When I stepped outside last evening everything was quiet, it was spooky. "A lot of people came from the other side of the church where the attack happened and they looked angry, frightened and I heard the police and ambulances." 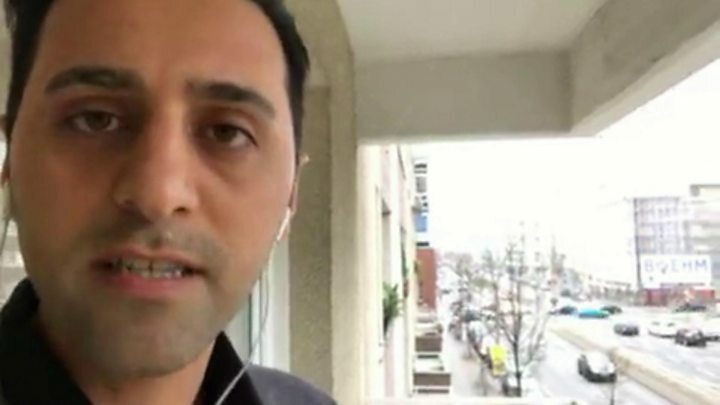 Berlin resident Ibrahim Colak is convinced the crash was deliberate. "I was with a group of friends and we were just deciding to make a move to go to have something for dinner," he told the BBC. "Then we heard a sound as if one of the Christmas market stalls was falling down. "When I turned, I saw the lorry was going full speed. I believe it was definitely an attack. It wasn't stopping or trying to manoeuvre out of the way." Mr Colak said he removed some wood that had fallen on some of the people in the market "asking them if they were OK". He added: "I was trying to help at the back of the lorry the people as well, but it was all, oh God, it was just horrible to describe." British tourist Rhys Meredith, from Cardiff, was at the market with his girlfriend when the lorry crashed into tables and wooden stands. "We were having a good walk around, soaking up the scene, soaking up the atmosphere," he said. "We had bought food and had we carried on we would have walked down the path the truck would have been down and we more than likely wouldn't be having this conversation right now." Mr Meredith said the lorry caused "complete and utter devastation". "Myself, along with a group of locals, had tried pushing collapsed stalls off of the top of people who had already died. Unbelievable scenes I can't really put into context. "My girlfriend looked after a couple of people with very serious head injuries. "There was clearly no attempt (by the lorry) to try and slow down... We've seen stalls obliterated into nothing."